Ursula K. Le Guin has earned the status of being a visionary in the genre of science fiction and fantasy. I discovered her work through her Earthsea novels and stories, which I absolutely loved, and then later I read The Left Hand of Darkness, followed by The Dispossessed...and so was introduced to the various human colonies of Hain. These stories explore human nature and ask a lot of questions not easily answered. They are true masterworks of the genre. Now, Library of America has released a two volume set containing all of the Hainish novels and short stories, including some never before published works. I'm not going to get into reviewing the individual stories in this two volume collection. There are countless reviews already out there of the stories, and I would assume that if someone were to make the investment in this set, they would already be Le Guin fans. So instead, I'm going to focus on the books themselves, which honestly, I think any Le Guin fan would be proud to have as part of their collection. Like the rest of the Library of America books, the books in this two volume set are sturdy and well made. They are printed on high quality paper, and aren't too heavy to read like I find some other collectable editions of books. One could buy these as collectibles and still use them functionally instead of them just sitting on a shelf collecting dust. And speaking of dust--the slipcase for this set is very sturdy and high-quality as well, providing perfect protection for the books. The font in the books is pleasant and easy to read. The type is a decent size and spacing is comfortable. One of the coolest things about the collection is the end papers. Each book has illustrated end papers of maps drawn by Le Guin herself. All in all I think this set would be the perfect holiday gift for a Le Guin fan or even a science fiction fan in general. 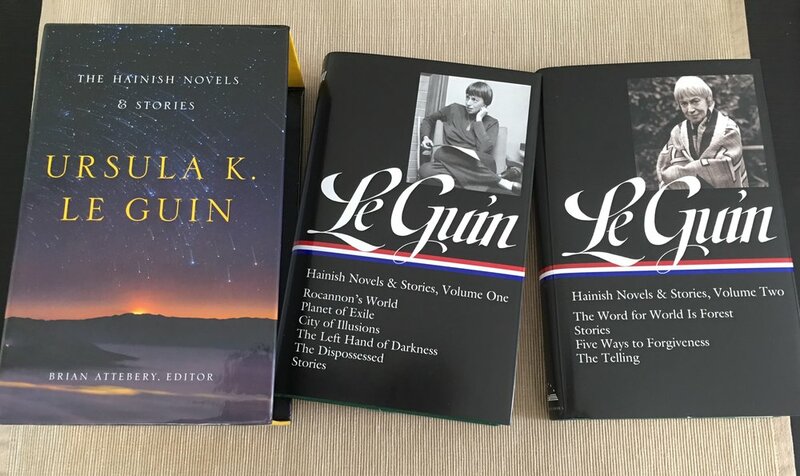 No reader of SF should go without reading at least one Ursula K. Le Guin book, and this set is a wonderful package of stories that can be read again and again.